The next real step forward was to begin working on the networking and time keeping. But those steps were the beginning of what is to become a real software project. Still small to medium sized compared to PC projects. But it will have a level of complexity that Ardunio projects don’t usually achieve. What this means is the Arduino IDE would be wholly unsuited for developing it. I ran into this a bit with the Robot project. Towards the end of development as some complexity emerged with the socket communications, it got fairly difficult to manage in the Ardunio IDE. My solution was to fall back to my trusty C++ IDE Code::Blocks. I love this IDE, so light weight, cross-platform, and infinitely configurable. C::B has some high level support for AVR projects (that’s the architecture of the micro-controller that the Arduino uses), but it’s really a thin veneer. All of the guts, GCC-AVR and others, must be setup on your own. That was a gooooood day. So I’m waiting on that to be delivered before I can continue. This entry was posted in Arduino, Uncategorized and tagged Arduino on August 27, 2011 by Wavesonics. As I stated in my last post, I began some actual work on this project over the weekend. What’s some times not appreciable, is the amount of time it takes just to get started on something like this. Finding all my Arduino parts and pieces, installing the software, figuring out all the little quirks again (It’s been more than 6 months since I finished the robot project). Finally being setup again for Arduino development, I set to soldering together a little voltage regulator for my bread board. It would allow me to put in anywhere between 3V and 36V and get a nice clean 5V signal out. This way I could independently power my breadboard without extra wires from the Arduino. 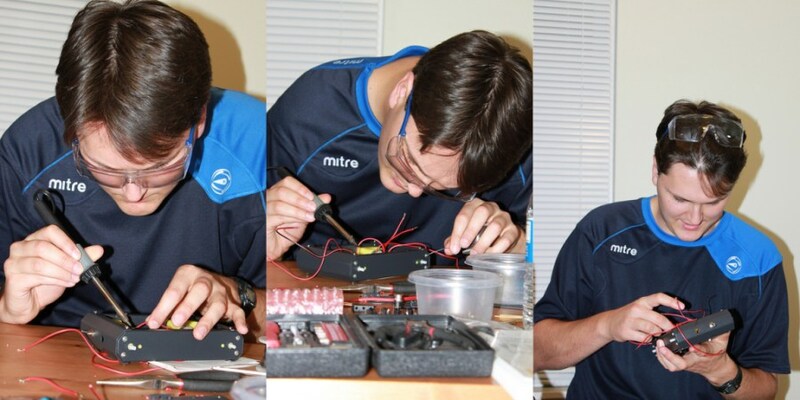 Next I needed to test my pressure sensor, to figure out how it works and how best to use it. I started by building a little RC (resistor capacitor) circuit as described in the sensor’s user manual. But quickly realized this wasn’t necessary with the Arduino, Just using one resistor and an Analog pin I could read it directly. Problem was, I was getting these highly variable values. In fact, when graphed over time, they looked quite a bit like the charge and release cycle of a capacitor. Anyway, I happily played around with my sensor, creating functions to produce readings in lbs rather than voltage and such. It was fun and cleared the way for what was, in my mind, one of the biggest question marks for the whole project. This entry was posted in Arduino, Uncategorized and tagged Arduino on August 24, 2011 by Wavesonics. 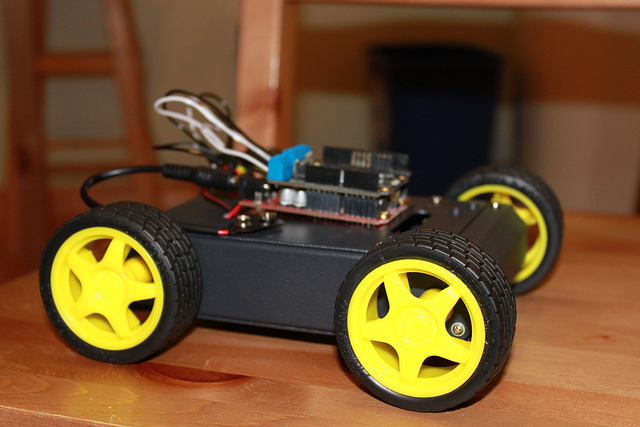 Over the weekend, many weeks of research culminated in the first concrete progress on my new hardware project. First let me give a run down of the idea for this project. It’s an alarm clock that solves the problem using a pressure sensor. The sensor will be between my mattress and box spring, so it will “know” if I’m still in bed, and simply not allow me to turn an alarm off until I get out of bed and stay out. Though I will still be able to snooze alarms as usual. Time always accurate using NTP (Network Time Protocol), never set it again after losing power! OLED touch screen for simple input, vibrant graphics, no back-lighting for good night time viewing. Alarms scheduled using Google Calendar. Never have a work alarm go off on the weekends, vacations, or days off. Pressure sensor to ensure alarms are not turned off while still in bed. Current weather conditions displayed on screen. WAV or MP3 playback for more pleasant alarm types. 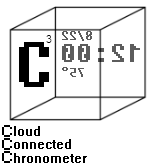 I’m also investigating a speech synthesization chip (SpeakJet) to allow it to talk 😛 And obviously there are many more possibilities having an internet connected alarm clock that I will explore once the base features are implemented. So stay tuned for more updates as I progress on this! 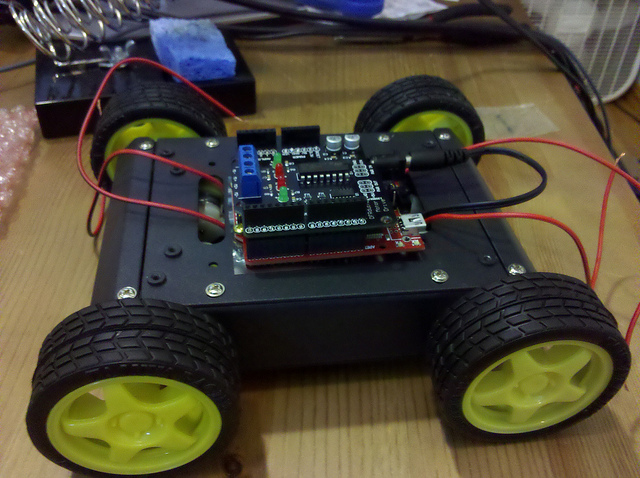 This entry was posted in Arduino, Uncategorized and tagged Arduino on August 22, 2011 by Wavesonics. The next day at work it was all I could think about, and around lunch time, it hit me. They are in series! 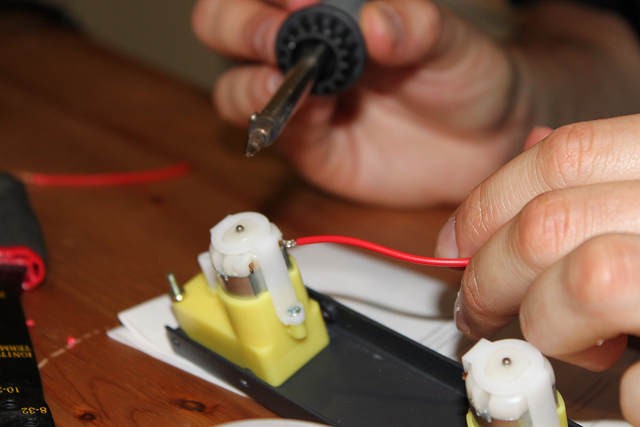 I’m dividing the voltage between the two servos! If I hook them up in parallel they’ll EACH get 9V! That night after a flurry of cutting, de-soldering, and re-soldering, it was ready. Popping a 9V on it made it leap forward! Excited, I set to work hooking the logic boards together, but when it came time to affix them to the chassis I encountered another problem. It wasn’t really meant to host a board like this. The screw holes were probably intended for something else, but certainly not for my Arduino. Additionally, I have a bare circuit board I’m trying to attach to a metal chassis! I looked all around in my spare parts for some sort of fastener or holder or something to mount my logic boards with to prevent them from shorting out on the chassis, but couldn’t find anything. Finally I settled on cutting an anti-static bag from an old video card and screwing the boards awkwardly through that bag and onto the chassis however I could make them fit. 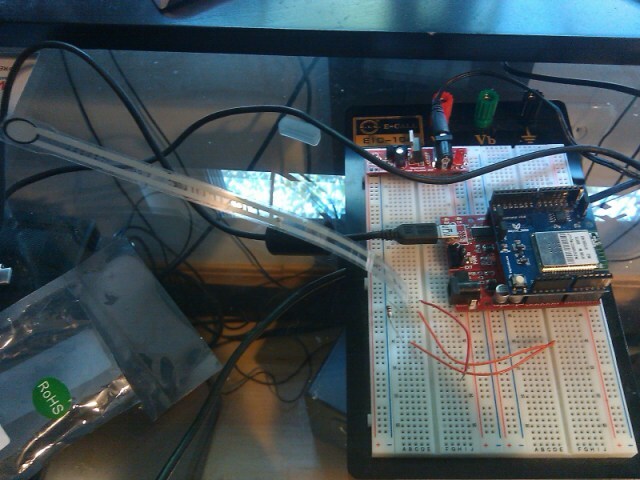 I then set to testing out some stuff with the Arduino. 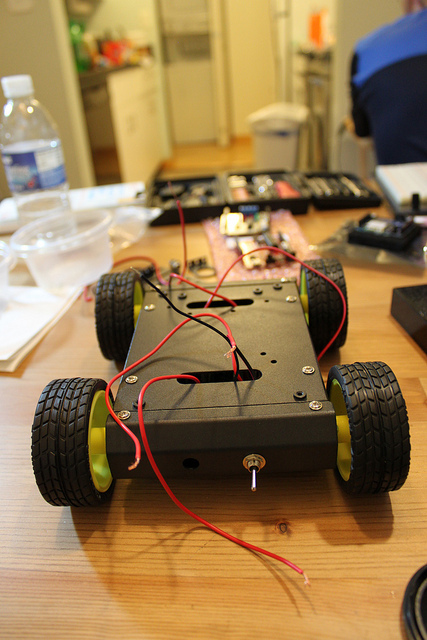 Read up on the docs for the motor driver, wrote some test programs making it move and turn. Then did the same with the wireless chip, tested hosting a webserver on it and allowing you to control the motors by clicking links. It worked! It wasn’t very responsive of course, reloading the page after a link click was pretty slow and all. But it worked! So I called one of my friends via Skype who lives in Texas, and using the webcam on my laptop gave him a view of the robot on the floor. 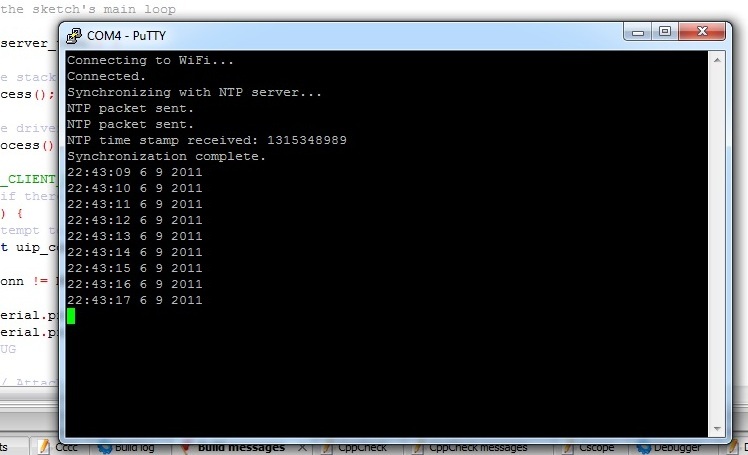 Then I setup some port-forwarding so he could access the server hosted on the robot, and it was ready to go! I stepped back, couldn’t see the laptop because of how it was positioned for the webcam. 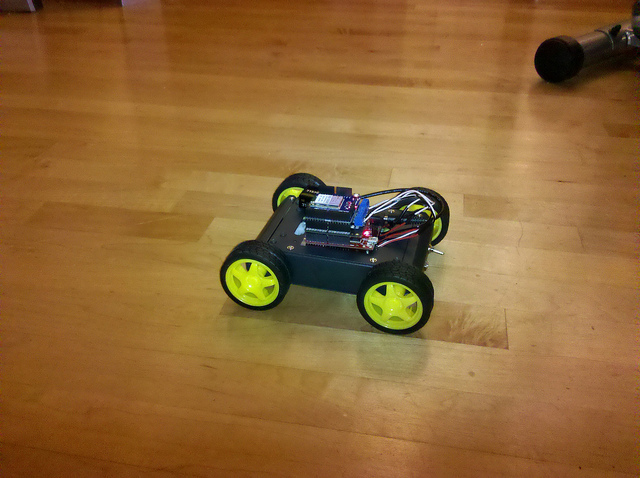 And all of a sudden this little robot starts moving on its own, via commands from my friend in TEXAS! (I live in Boston) I mean c’mon! We really take the internet for granted I know, but the series of events that are transpiring to make his actions in Texas manifest themselves in the real world in my apartment in Boston… I mean c’mon!!! Over the next several days I fast iterated. I ripped out the webserver and wrote a proper socket server for the robot, and socket client that ran on my home server. It was MUCH more responsive. Then I wrote a webpage that used AJAX to send “real-time” control commands to stub PHP script, which in turn sent them onto the socket client. And finally, after much research, I found a webcam that worked with Linux, had auto-focus, and great video quality (glass optics, no plastic crap), and a software package for streaming the video to the control webpage (no X11 or GUI of any kind, which restricted my options quite a bit). 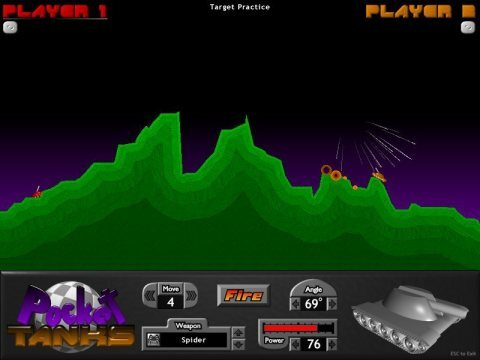 This was a blast, you could log onto the site, see the robot from the webcam mounted in the corner of the room, and drive it around using WASD or GUI controls on the webpage. And I did some input wrapping so key down & key up worked the way you’d expect. It was fun. But it was lacking something big. I wanted to drive this robot in first person perspective. 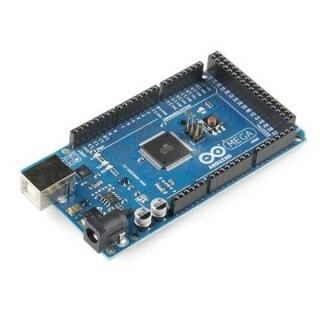 This entry was posted in Arduino, Uncategorized and tagged Arduino on August 18, 2011 by Wavesonics. 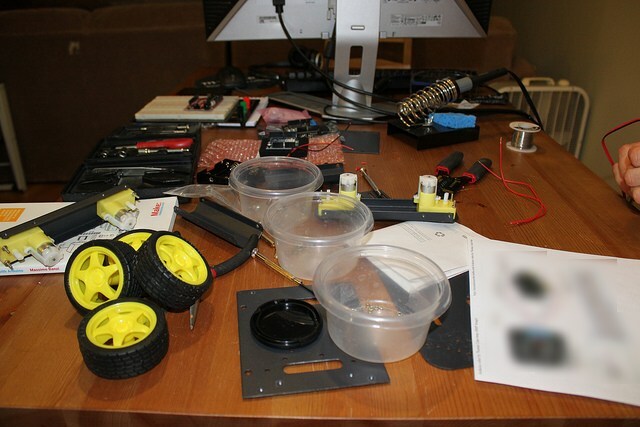 We’re in the early planning and prototyping stages for our next project. So I worked up a little prototype of the core tech we will need. This is about 4 hours of work. The is tech is inspired by two main games. One should be somewhat obvious. 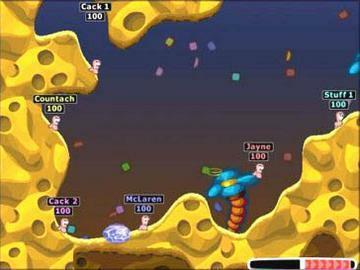 The Worms series. It was an artillery game with a few twists, the most interesting of which (in my opinion anyway) was the terrain destruction! Next I’m looking to implement this on Android in libGDX. Some discussions with the libGDX team leads me to believe I’ll have to implement the actual pixel pushing using the Android NDK in order to get the unfettered access to the pixel buffer that I need. I’ve never worked with the NDK so this should be a fun learning experience to get my hands dirty with it! This entry was posted in GameDev, Uncategorized on May 7, 2011 by Wavesonics.